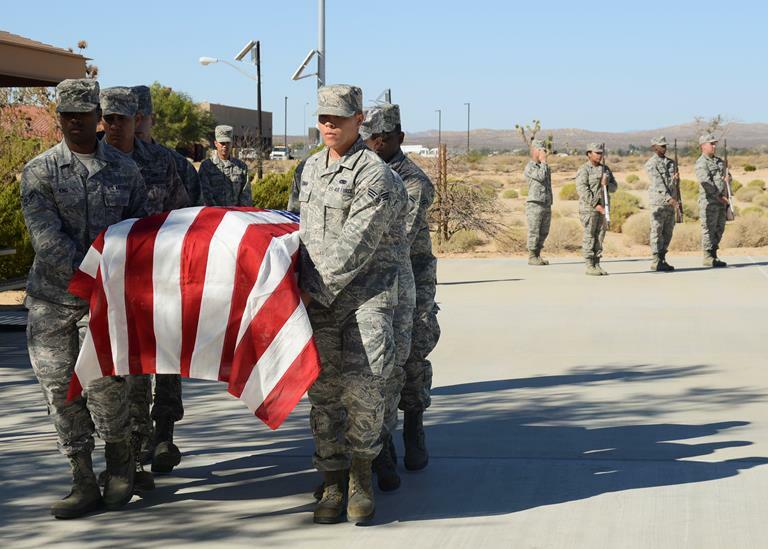 Seventeen Airmen performed a mock funeral during a graduation ceremony at the Airmen Leadership School where they became ceremonial guardsmen Oct. 16. (U.S. Air Force photo by Rebecca Amber). 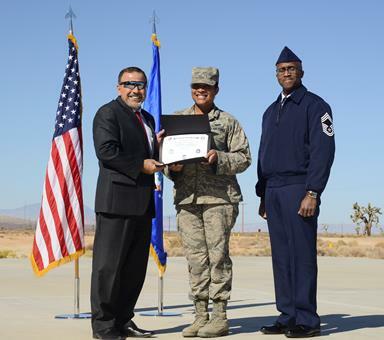 EDWARDS AFB – Seventeen Airmen became new ceremonial guardsmen during a graduation ceremony recently at the Airmen Leadership School. The ceremony took place outside on the parade field where the graduates performed a mock funeral for an active duty service member. The funeral was narrated by Tech. Sgt. 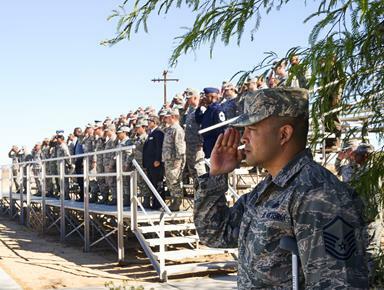 Maurice Nolet, 412th Force Support Squadron, Edwards AFB Honor Guard NCOIC. Nolet noted that almost every member of the Honor Guard has a primary job and this additional duty is no small commitment. What seems like 15 minutes to the audience can actually be much longer when preparation, travel time and lunch are considered. “It’s kind of like any other performance, a lot goes on behind the scenes that you don’t see,” said Nolet. “It’s important that the supervisors understand the Honor Guard program is a priority for military funerals,” said Master Sgt. Harold Padua, 412th FSS, Base Honor Guard superintendent. The Edwards Honor Guard, along with March Air Reserve Base, and Los Angeles AFB, accepts all funeral requests in Southern California. Alexander Kovras, 412th Force Support Squadron director (left) presented certificates to each of the graduates. (U.S. Air Force photo by Rebecca Amber). According to Padua, they work with five national cemeteries, seven counties and over 150 private cemeteries and funeral homes. Funeral requests come in on a daily basis, sometimes with less than 24 hours notice. The group is available seven days a week and on holidays with an average of around 160 services each month for both active duty and retirees. The job however is not performed alone. Each active duty funeral calls for 20 ceremonial guardsmen. The training is a week and a half long and each graduate learns to carry out each function of the ceremony. There are four basic components to an active duty service, the pall bearers, the firing party, the color guard and bugle player. All of the guardsmen follow the guidance of the NCOIC.